First, examine your home’s current water system and bathroom layout because this will dictate to a certain extent what shower system you can implement in your bathroom. If you are considering a new bathroom layout during your renovation, you may have to relocate the plumbing to accommodate your new floorplan. While this can be costly, it also gives you the opportunity to easily add any necessary plumbing for more complex features or more shower fixtures, as well as install a new water system and pipes to create a truly spa-like experience. 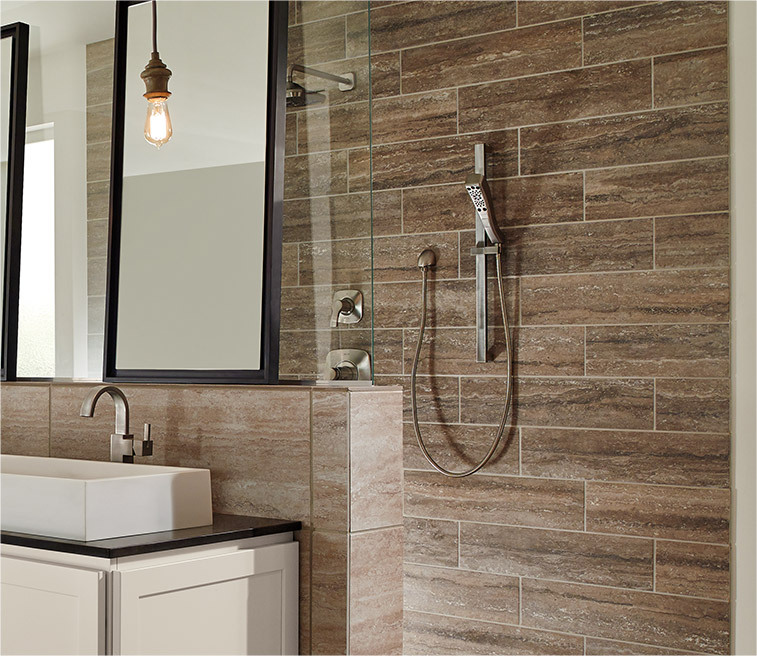 Once you have decided what to do inside your walls, you will need to pick a type of shower fixture. There are many different types of shower fixtures and heads to best suit any family’s needs. For a luxe, relaxing experience, a rain shower delivers everything from a full rain storm to a light drizzle. In family homes with children, elderly relatives, or people with limited mobility, a hand-held shower head provides flexible and easy usage to make showering simpler and more accessible. No matter what features your family needs, the Henry Kitchen & Bath showrooms house many options, so you can find the perfect fixture to complete your bathroom. After selecting the type of fixture best suits your needs, the final step is to choose the finish and style of your shower system. As one of the largest fixtures in your bathroom, your shower is an important part of your bathroom design and plays a major role in establishing the overall style and aesthetic of your space. When choosing the material of your new fixtures, consider the overall look you are trying to achieve, the color of your bathroom tiles, and the finish of your other bathroom fixtures. In a contemporary bathroom with white subway tiles, a matte-black shower head provides the perfect contrast to make your design pop. For a traditional bathroom, gold fixtures complement marble tiles for an elegant, timeless look. As one of the most used fixtures in the bathroom, your shower should be functional, durable, and complement your space’s aesthetic. With all the parts you need to build your perfect shower from top brands like Basco and Delta Faucets, Henry Kitchen & Bath has the right fixtures to create your family’s new shower. The right shower head can transform your shower experience from a daily chore to a blissful escape. 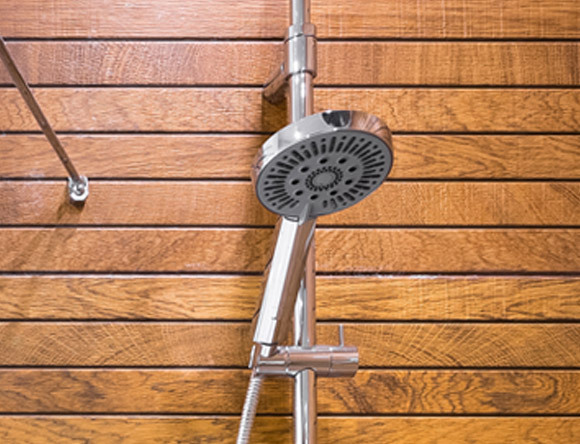 There are two important factors to consider when purchasing a new shower head: the features your family needs and the finish that will best match your bathroom’s style. There are many types of shower heads, each with unique advantages that best suit different families and lifestyles. By far the most popular option, the standard fixed shower head is permanently mounted to your shower, and the height can be adjusted during the renovation to best suit your family’s requirements. Hand-held shower heads are connected to the wall by a flexible tube that allows for a full range of motion, which is ideal for cleaning children, pets, and elderly relatives as well as the entire shower and tub area. Rain showers are large-sized shower heads that are installed directly overhead to simulate showering in the rain. This luxurious fixture creates a spa-like experience with multiple settings that range from a soaking rain storm to a gentle drizzle. With thousands of options from the industry’s top brands, our talented designers can help you select the best shower head for your bathroom from the fully stocked catalog at Henry Kitchen & Bath. A well-functioning shower door is a critical design element in creating a bathroom that works for your family’s daily needs. Consider which style of shower door will work best in your space – for larger bathrooms, a pivoting door that opens out provides easy access while a sliding shower door is ideal for smaller bathrooms where floorspace is limited. Shower doors come in many styles and finishes, so you are sure to find the perfect one at Henry Kitchen & Bath to complement your space. In communal bathrooms, opaque glass adds necessary privacy while transparent shower doors allow more light for a tranquil showering experience. On framed or semi-frameless shower doors, the finishing hardware comes in a wide variety of finishes and materials from the standard nickel tones to bold gold and bronze tones. 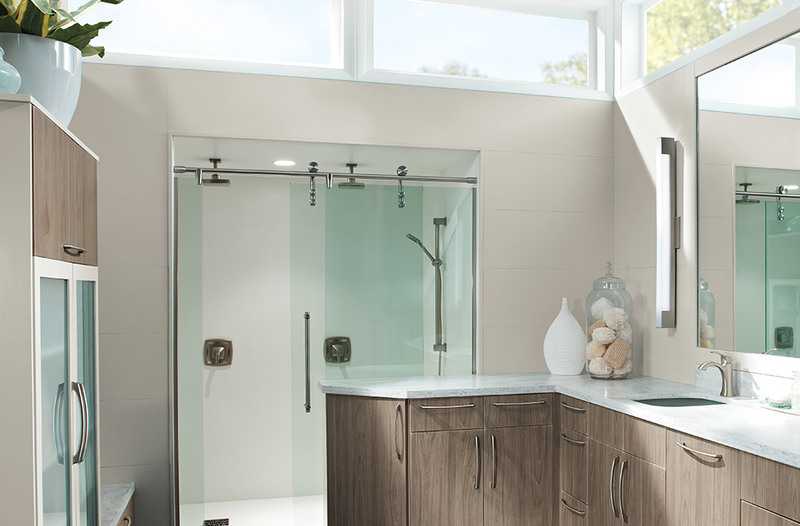 No matter your bathroom layout or family’s needs, Henry Kitchen & Bath has the perfect shower door for you! 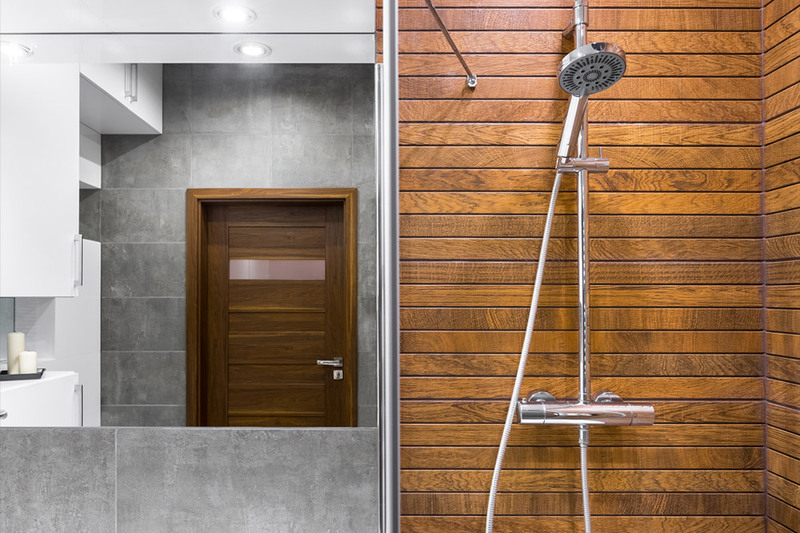 A shower system is comprised of multiple in-wall components typically including a showerhead, hand shower, and temperature valve to give users a variety of shower options. These panels are one of the best investments for your family’s bathroom because they not only complement the overall bathroom design but also provide multiple functional features to satisfy any of your family member’s needs. For example, a rain shower head provides a luxurious, soothing shower while an attached hand-held shower head also allows easy cleaning of young children or pets. 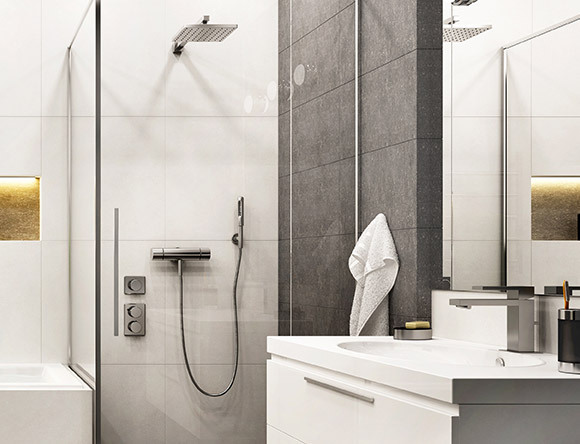 Whether you have a large family with varying needs or just crave a truly all-in-one shower experience, you can find your perfect shower system that delivers both high value and style at Henry Kitchen & Bath. Your new shower is an investment into the style and function of your family’s home, so choosing the right shower for your family’s needs is one of the most important decisions in creating a bathroom that works for years to come. At Henry Kitchen & Bath, our experienced designers combine their knowledge of the latest bathroom trends with the product listings in our extensive catalog to help you find the best shower system for your family and create your dream bathroom. Whether you are refreshing your space or considering a full renovation, get your project started with us today by scheduling an appointment – Henry Kitchen & Bath can make your dream bathroom a reality!